OKLAHOMA CITY — Governor Mary Fallin today said the first-ever map developed by the United States Geological Survey (USGS) showing potential ground-shaking hazards from both human-induced and natural earthquakes illustrates why action taken earlier this year by the Oklahoma Corporation Commission (OCC) was necessary. On Monday, USGS released maps revealing potential ground-shaking hazards from both human-induced and natural earthquakes. 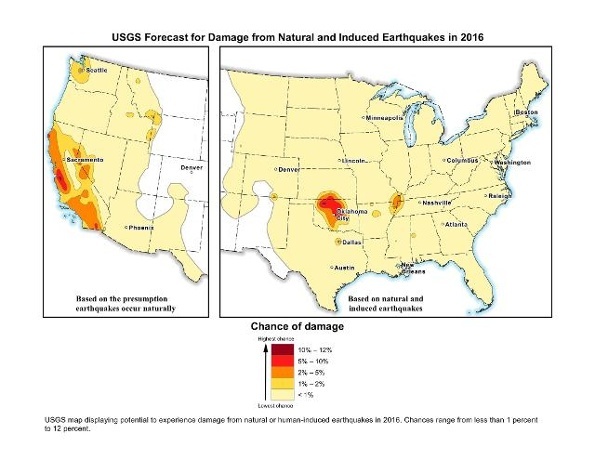 The USGS said the maps are also the first one-year outlook for earthquake hazards and the first time the USGS has identified human-induced earthquakes. According to the USGS, the new maps show six states face the highest hazards: Oklahoma, Kansas, Texas, Colorado, New Mexico and Arkansas. Oklahoma and Texas have the largest populations exposed to human-induced earthquakes. Researchers say the state’s rise in earthquakes is caused by the disposal of produced saltwater deep into the Arbuckle formation. The OCC, which has constitutional authority over oil and natural gas activity in the state, is following the recommendation of researchers and is continuing to work with operators to significantly reduce the overall disposal of produced water into the area of seismic interest within the Arbuckle formation area to 40 percent below the 2014 total. The OCC last month issued a wide-ranging directive to saltwater disposal well operators in areas experiencing earthquakes. In the past year, regulators have issued more than a dozen directives to disposal well operators to limit activity or shut down in areas of earthquakes. Today’s USGS report, which used earthquake data from 2015, states that some places in Oklahoma may experience damage if the induced seismicity continues unabated. “Oklahoma remains committed to doing whatever is necessary to reduce seismicity in the state. The report supports the actions that we are taking,” said Fallin, who in 2014 formed the Coordinating Council on Seismic Activity, which organizes state resources and related activities to address Oklahoma’s earthquakes. She said the USGS report will be reviewed to evaluate how recommendations can be included into the state Emergency Operations Plan and ongoing preparation efforts. The governor, during a meeting with her Cabinet secretaries earlier this month, discussed how the state would respond to a large-scale seismic event. Fallin asked Department of Emergency Management Director Albert Ashwood to lead a statewide working group to develop an earthquake response plan. Ashwood and several agency directors held their first meeting this morning. Oklahoma Energy and Environment Secretary Michael Teague said the USGS report released today highlights why action has been taken to address induced seismic risk in the state of Oklahoma. “The Oklahoma Corporation Commission’s work to further reduce the overall disposal of produced water into the Arbuckle Formation is in line with researchers from across the country as the best way to lower the potential for seismic hazard highlighted in the USGS report,” he said. One Response to "USGS reveals maps of Oklahoma as highest chance of damage; Governor says State Regulators are taking correct action"
We as Oklahoma residents needed this wake-up call. It’s our time as voters to see that we elect legislators who are working toward more renewable energy since too many keep burying their heads in the sand and not thinking about the State’s future. Our ground water is being depleted, our land is being polluted by chemicals injected back as waste, the landscape is filled with rusting tanks, trucks are ruining our roads . . . and the list goes on. I am not trying to put the brakes on our oil and gas industry but this is 2016 and a better way can be found to deal with and extract our energy needs. Did you know Oklahoma ranks NINTH in the nation in the use of renewable energy and FOURTH in the nation in the use of Wind energy? Yes, we can still create jobs and not create damage to this land we love. Let’s make sure future generations of Oklahomans can be proud of what their ancestors leave behind.